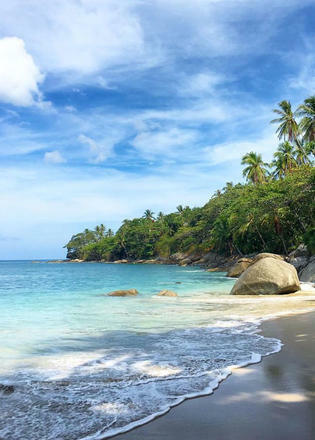 The islands around Thailand and Myanmar are as close to paradise as you’re likely to get on Earth — soft white sands, warm and clear seas lapping against deserted beaches. Perfect for water sports, hiking, diving and snorkelling, find your sanctuary on board a luxury yacht in the archipelagos. The 54.3 metre luxury yacht Tiara, who is available year-round in the Indian Ocean and South East Asia, can sleep up to 10 guests in five luxurious cabins. She features a convertible tender hatch/Jacuzzi, plenty of deck space with outdoor cinema and an on board kitesurfing instructor. 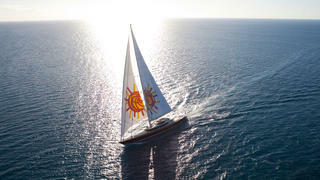 She is currently managed for charter with Y.CO and her weekly rates start from €180,000. Day One — Phuket Head straight to the floating jetty and Patong Beach from Phuket International Airport, where Tiara’s tender will be waiting to take you out to her anchorage in the bay. This is your opportunity to explore the yacht — Tiara sleeps up to ten guests in five cabins, and her features include a forward tender hatch that converts into a Jacuzzi on deck. Her water toy list includes kayaks, wakeboards, towables, windsurf boards and Seabobs. The islands around Thailand and Myanmar are as close to paradise as you’re likely to get on Earth — soft white sands, warm and clear seas lapping against deserted beaches. Perfect for water sports, hiking, diving and snorkelling, find your sanctuary on board a luxury yacht in the archipelagos. The 54.3 metre luxury yacht Tiara, who is available year-round in the Indian Ocean and South East Asia, can sleep up to 10 guests in five luxurious cabins. She features a convertible tender hatch/Jacuzzi, plenty of deck space with outdoor cinema and an on board kitesurfing instructor. 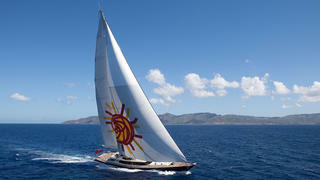 She is currently managed for charter with Y.CO and her weekly rates start from €180,000. Head straight to the floating jetty and Patong Beach from Phuket International Airport, where Tiara’s tender will be waiting to take you out to her anchorage in the bay. This is your opportunity to explore the yacht — Tiara sleeps up to ten guests in five cabins, and her features include a forward tender hatch that converts into a Jacuzzi on deck. Her water toy list includes kayaks, wakeboards, towables, windsurf boards and Seabobs. After a night in the bay, set sail for the Similan Islands for a day exploring the islands’ natural wonders — as fishing, water sports and jetskiing, aren’t permitted, you’ll be able to revel in peaceful surroundings. Trek through island trails, explore the untouched beaches and marvel at local wildlife. 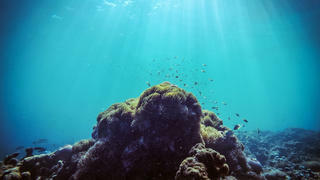 Experience some incredible underwater sightseeing when diving in Mergui in the vast National Marine Park, with clear water that offers up to 30 metres visibility. Leave the Similan Islands early in the morning to set sail for Kawthaung, a border town in Myanmar. After completing customs formalities, head to Island 115 for the rest of the day. While away the hours swimming and snorkelling in clear turquoise waters before returning to Tiara for the evening. Head to the jungle haven of Great Swinton Island and muster the energy to hike up the mountain on the island’s south east corner — the panoramic views will be worth the climb. 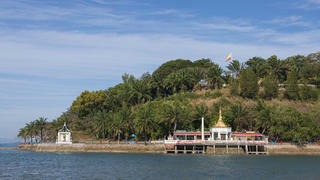 Known as Kyun Pila in Burmese, the island has a plethora of golden beaches for you to relax, swim and snorkel. In the evening settle down in the outdoor cinema on board Tiara to watch your favourite movie under the stars. Head to the jungle haven of Great Swinton Island and muster the energy to hike up the mountain on the island’s south east corner — the panoramic views will be worth the climb. Known as Kyun Pila in Burmese, the island has a plethora of golden beaches for you to relax, swim and snorkel. 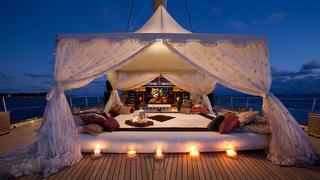 In the evening settle down in the outdoor cinema on board Tiara to watch your favourite movie under the stars. Anchor to the west of the island for a choice of two incredibly picturesque beaches that both offer spectacular snorkelling. Sharks use the shallow waters in the south east of the island as a nursery until they grow large enough to migrate to the deep water reefs. Sometimes visitors to Clara Island can spot tracks in the sand in the same spot where female turtles have come to lay eggs. Despite being approximately the same size as Singapore, Lampi Island has been designated as a national park by the government and is therefore completely uninhabited. One of the must-see adventure destinations to visit by superyacht, the heart of the island is covered in dense and lush rainforest. On the west coast at high tide visitors can take a small boat or sea canoe out along two tidal rivers to see 30 metre tall mangrove trees, wild orchids and amazing birdlife. The south west of the island features three long beaches that are divided by a freshwater river — at low tide there’s a sandy spit connecting to the other island where it meets the sea, which makes for a wonderful sandy stroll. Despite being approximately the same size as Singapore, Lampi Island has been designated as a national park by the government and is therefore completely uninhabited. One of the must-see adventure destinations to visit by superyacht, the heart of the island is covered in dense and lush rainforest. 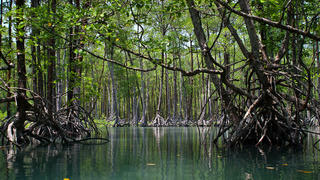 On the west coast at high tide visitors can take a small boat or sea canoe out along two tidal rivers to see 30 metre tall mangrove trees, wild orchids and amazing birdlife. The south west of the island features three long beaches that are divided by a freshwater river — at low tide there’s a sandy spit connecting to the other island where it meets the sea, which makes for a wonderful sandy stroll. Sail back to Kawthaung to check out of Myanmar and head into Thailand, where you can explore the stunning marine park of the Surin Islands. After checking out in Kawthaung, head straight for Koh Surin, an archipelago in the Andaman Sea. A thin 200 metre strait divides the two islands of Koh Surin Nua and Koh Surin Tai, which is surrounded by small beaches and pockets of mangrove trees. The marine life here is vibrant, making it perfect for snorkelling and scuba diving — it's definitely one for the diving bucket list. Don’t miss the manta rays and whale sharks at the world-famous Richelieu Rock. 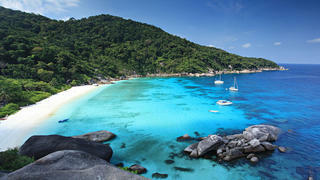 The privately owned island of Pansea is accessible only to Amanpuri Resort guests. It was voted one of the best hotels in the area by Condé Nast Traveller and your crew will be able to arrange bookings to the resort. If you’ve not got anywhere else to be in a hurry, enjoy a morning on Pansea Beach or making the most of the facilities at the Amanpuri Resort. 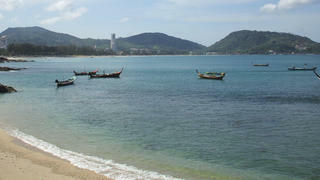 After lunch, travel to Patong Bay for departure.